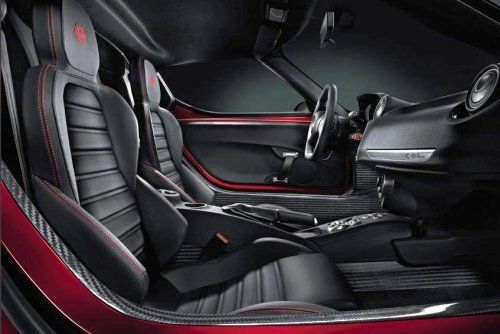 The sole interior teaser of the 2014 Alfa Romeo 4C combines cutting edge supercar technology and Italian luxury in what looks like a surprisingly roomy cabin. It appears as though the entire inner body panels that run around the door openings and up behind the seats are clad in exposed carbon fiber with more slick looking carbon fiber found on the central “hump” that also carries the emergency brake handle and a collection of buttons that are impossible to identify from this one picture. It is expected that the Alfa 4C will be a push button transmission control system that will work with a set of steering wheel mounted paddle shifters and we can guess that some of these buttons on the center console serve thus duties. It also looks as though there are no window controls on the driver’s door panel (or at least anywhere that we can see in this picture) so the controls for the windows may also be down there. There may also be buttons for a sport mode or some other adjustable performance parameters of the new Italian sports car. Next, in addition to the paddle shifters, the steering wheel of the 2014 Alfa Romeo 4C will pack a little more supercar style with the addition of a leather wrapped, flat bottom steering wheel. The flat bottomed steering wheel allows for my room for the driver to get into the car without banging his or her knees on the steering wheel. It also looks awesome…which is ultimately the reason that so many automakers are going with this style steering wheel in their performance models. Based on what I can see in this picture, the star of the new Alfa Romeo 4C interior is the set of super thin sport seats. Clad in black leather with bright red stitching with a red embroidered Alfa Romeo logo on the rests, these race inspired thin seats help to maximize interior space to allow for more range of adjustability to make the 4C comfortable for taller drivers and passengers. These seats include huge side bolsters around the rib area with shallower bolsters around the shoulder. The base of the seat has a deep pocket for the driver and passenger while the thin profile of the seat base allows the buckets to sit lower…thus offering more head room for taller occupants. These bolsters on the back and base should go a long way in making sure that the driver and passenger of the new Alfa Romeo sports car stay put under hard cornering. The thick rib design in both the seat backs and bases will likely help insure that the 4C offers as much comfort as it does style and grip. Most importantly, these seats probably don’t weight very much so the help improve performance through weight savings. When you think of a modern Italian sports car interior, the 2014 Alfa Romeo 4C appears to have everything needed to show that is deserving of that Italian sports car reputation. While we still haven’t gotten to see what the gauge cluster or the center stack looks like – what we can see looks awesome. All of this carbon fiber will surely resonate well with American buyers while the functional aspect of the interior design will offer a pure, high performance driving experience. The 2014 Alfa Romeo 4C will make its grand debut next week at the 2013 Geneva Motor Show so full details of the car that will reintroduce the American car buyer to the Alfa brand is only a week away.